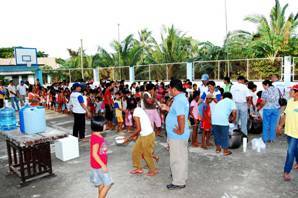 The HNS Unit in Virac, launched a Feeding Program in Brgy. Sto. Cristo, Virac lzst Oct 4. It was co-sponsored by Mrs. Ester Alcantara, wife of former Gov. Severo Alcantara. More than 100 children benefitted from the program. This will be a continuing activity in all parts of Virac. Before the Feeding a catechesis was conducted among the children including topics for the protection and conservation of the natural environment.